The Costa del Sol is also known as the Costa del Golf, due to the large number of golf courses. Andalucia has over 90 golf courses and is a real golfer's paradise; due to its unbeatable climate you can play golf all year long. All golf courses are of very high quality and suitable for beginners and experts. 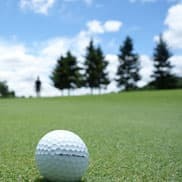 You do not have to become a member of a particular golf course to be able to play. 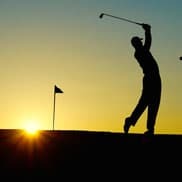 Most golf courses have websites where you can make reservations for green fees, the easiest way to plan your golf holiday. 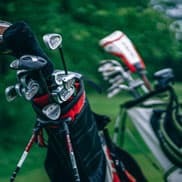 In case you bring your own golf clubs and need a transfer from Malaga Airport, Malagaairport-transfers.com offers private transfer services for small and bigger groups in spacious cars which fit larger luggage. You can also request a quote, without obligations, using the form on the top of this page. Probably the most popular golf club on the Costa del Sol. Divided in two parts: Los Olivos and Los Lagos, both with 18 holes and in outstanding condition. There are a few lakes on site and water hazards, while trees are strategically placed to give shadow and protect the large greens. - this golf course is situated in Mijas. 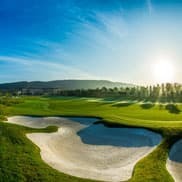 This 18 hole, 72 par new golf course located in La Cala de Mijas comes with fantastic sea views and an exquisite layout. This magnificent 18 hole golf course designed by Dave Thomas is exclusively for the use of guests of the 5 star resort. The staff will collect the clubs and bring them to the buggies. No over-crowded rounds and morning tee times guaranteed. - this golf course is located in Marbella. Located in Alhaurin el Grande, next to the Sierra of Mijas, this 18 hole, par 72 golf course was designed by the legendary golfer Severiano Ballesteros. Located in Benahavis-Marbella just five minutes inland from exclusive Puerto Banus, this very well maintained golf course was opened in 1989, and has been extended into a 27 hole golf complex. Located at the beach front of Sotogrande and founded in 1964, it's often voted among the top 10 golf courses in Europe. Lakes, fast greens, and strong winds make it a real challenge to any player. Just 10 minutes away from Malaga city/airport and located on a privileged location on the sea shore of the Costa del Sol. This is the oldest course in Andalucia, founded in 1920, linked to the British Royal Family. They sell green fees of 9 or 18 holes. For the 9 hole green fee, no handicap is necessary. - This golf course is located in Malaga. An enjoyable 9 hole par 27 golf course, ideal for beginners but also entertaining for expert golfers. Magnificent sea views and good priced green fees. - This golf course is situated in Benalmadena. Don't forget that Malagaairport-transfers.com offers private taxis and transfers in luxury cars and mini-vans which fit larger bags such as golf bags.